LinkedIn Company Page Kaise Banaye? LinkedIn Page Create Karne Ka Fayde Kya Hai? 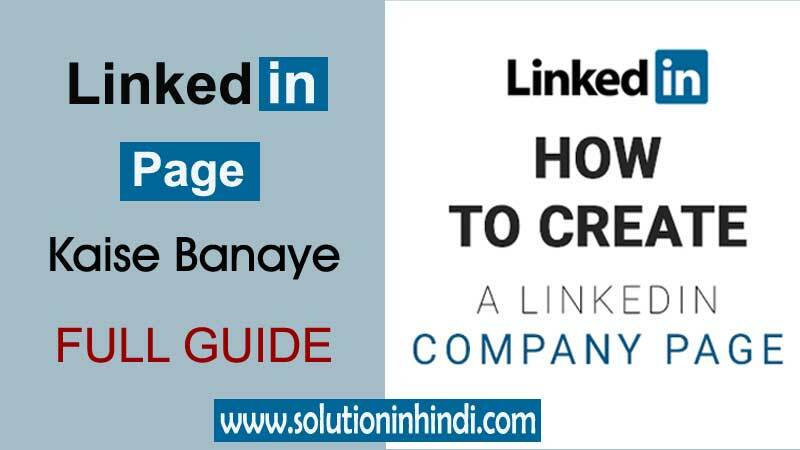 LinkedIn Business Page Kaise Create Kare? Uski Puri Jankari Hindi Me Apko Iss Article Me Mil Jayega. Dosto Linkedin Ek Bahut Hi Popular Social Networking Site Hai, Aur Yaha Jiyadatar Business Person Hi Active Rahte Hai, So Agar Apke Koy Online Business Hai, Toh Apke Company Ke Page Create Karke Apke Clint Ke Sath Yaha Connected Rah Sakte Hai, Aur Free Me Promotion Kar Sakte Hai. Agar Aap Blogger Hai Toh LinkedIn Page Create Karna Na Bhule, Kyu Ki LinkedIn Se Aapke Site Ki High-Quality Backlink Milenge, Jisse Apke Website Ki Ranking Increase Hoga, Aur Blog Post Ke Link Share Karke Quality Trafic Yaha Se Paa Sakte Ho. Isse Article Ranking Increase Karne Me Madad Hoga. #1. LinkedIn Page Create Karne Se Apko Bhut Sare Fayde Milenge, Khaas Karke Business Purpose Ke Liye LinkedIn Sabse Best Platform Hai. #2. Agar Aap Student Hai, Aur Apko Job Milne Me Dikkat Ho Rahi Hai, Toh LinkedIn Account Create Karke Yaha Se Job Ke Liye Directly Apply Kar Sakte Ho, Yaha Apke Qualification Ke Mutabik Job Ke Notification Milega. #3. Agar Apke Website Hai Toh Official Page Create Karke Yaha Apke Visitor Ke Sath Connected Rah Sakte Hai, Aur Post Share Karke Free Me Promotion Kar Sakte Ho, Aur High-Quality Traffic Apke Website Me Bhej Sakte Hai, Jisse Apke Site, And Post Ki Ranking Badhegi. Aur Bhi Kay Bhut Sare Advantage Hai LinkedIn Page Create Karne Ka. 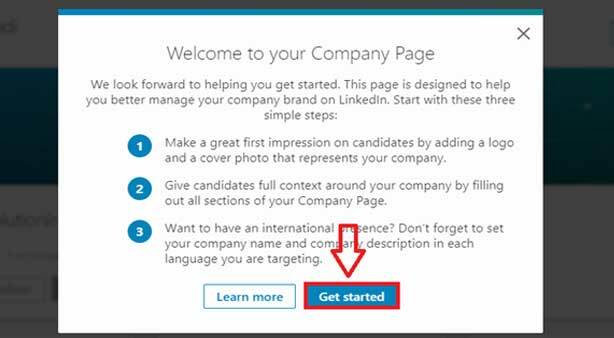 Step-1 Sabse Pehle LinkedIn Ke Official Website (https://www.linkedin.com) Me Jaye. Directly Jane Ke Liye Yaha LinkedIn Par Click Kare. Step-2 User Id Password Enter Karke Apke LinkedIn Account Login Kare. Note: Agar Apke LinkedIn Account Nahi Hai, Toh LinkedIn Account Kaise Banaye Uski Jankari Yaha Hai. Step-3 Agar Aap Computer/Laptop Me Create Kar Rahe Ho, Toh Top Ki Right Side Me “Work” Ka Option Me Click Kare. 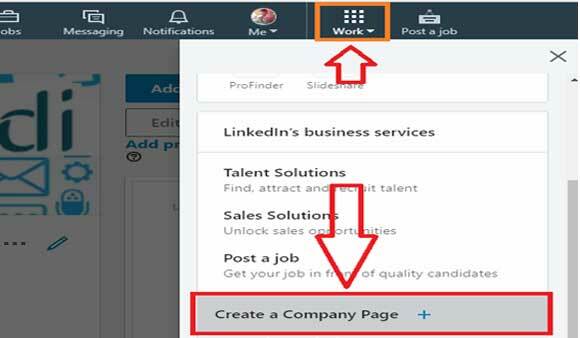 Note: Agar Aap Mobile Me Kar Rahe Ho, Aur “Work” Ka Option Nahi Mil Rara Hai, Toh Yaha ‘Create LinkedIn Company Page‘ Par Click Kare, Then Age Ki Step Follow Kare. 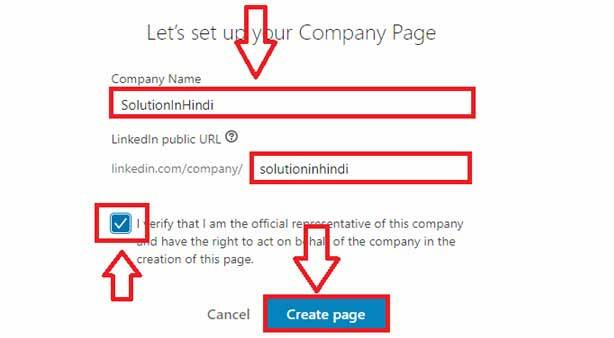 Step-4 Thoda Scroll Down Kare Phir ‘Create a Company Page‘ Me Click Kare. URL Bhi Check Kare, Kyu Ki Jab Koy Search Kare, Toh Find Karne Me Koy Dikkat Na Ho, So, Jo Apke Company Name Hai Wohi Dale. Now ‘Create Page‘ Par Click Kare. Step-6 Ab Get Started Par Click Kare. Done! Itna Karne Se Apke LinkedIn Page Successfully Create Ho Jayega. So Friends Ummid Karta Hu “LinkedIn Page Kaise Banaye In Hindi” Completely Guide Mil Gaye Honge, Agar Apko Kahi Kisi Step Me Problem Ho Rahi Ho, Ya LinkedIn Related Koy Bhi Questions Ho, Toh Feel Free Me Comment Karke Puche.